Home >> Generated from JAN's SOAR Information System on 4/26/2019 4:15:07 AM. The Innovative Winston-E Electric Sit-Stand Workstation is a next-generation electric standing desk converter that allows you to power between sitting and standing, with a stable freestanding base that lets you convert almost any desk into a standing workstation without the need to replace any furniture. 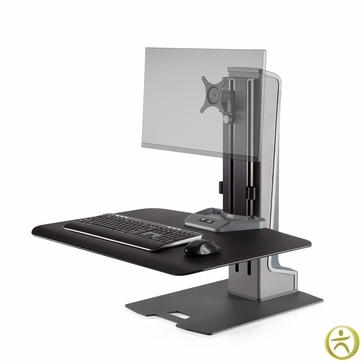 Supporting up to three monitors with flexible focal depth and tilt adjustment as well as independent movement, the electric Winston makes it nearly effortless to get your screen or screens at a comfortable height and distance. And with its large work surface and storage tray, the Winston-E lets you raise everything you need to work to standing height and back again so that you can alternate throughout the day.